Chemical Agent Decontaminant No1 Mk2 (CAD) is used by the UK military to decontaminate service equipment and stores which have been contaminated with liquid chemical warfare agents. This CAD kit is used with an appropriate portable pumping apparatus such as DAP2. 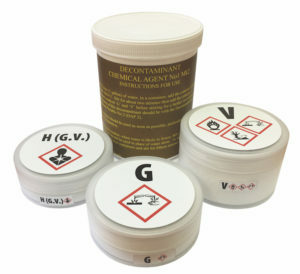 NATO registered Chemical Agent Decontaminant (CAD) kits comprise a combination of chemicals, which when dissolved in water will produce a decontaminant solution that will neutralise GA (Tabun), GB (Sarin), GD (Soman), GF (Cyclosarin), VX (Venomous agent X), HD (Distilled Mustard) and L (Lewisite) chemical warfare agents. Each kit is sufficient to produce 4.5L (1 Imperial Gallon) of decontaminant. Contains: Boric acid, sodium salt of dichloroisocyanuric acid, sodium hydroxide.